It’s early, still a few hours to go until enough light descends on the estuary for filming. But S/V Habitat is bustling as the crew prepares the gear for the coming day. The smell of coffee brightens tired eyes, and with the new day comes new hope for this once in a lifetime project. Fourteen months, four seasons, one goal. Capturing the stunning beauty of the Great Bear Rainforest for the giant IMAX© screen, the latest effort in leveraging awareness to help protect the region and its inhabitants. Twenty-five years of studying and telling the stories of the coast has well-prepared Ian McAllister and Pacific Wild for this new initiative. After 32 days of fall filming, a much-needed break, and two weeks of storms on Denny Island, we finally set off for winter diving. It is now day 18 of our winter voyage, and snow is falling on the waters of the Great Bear Sea as our divers enter the water, blanketing our boat with signs of Christmas. These trips can be long and demanding, but the season is short and every day is precious. Like the urchins, anemones, and fish that take full advantage of a slack tide, our whole crew on Habitat share an unspoken understanding that we should make the most of the time we have, and that feeling only grows on this trip as daylight becomes scarce. And so we have begun our fourteen-month journey with Habitat as our new home. From the graceful and unusual creatures that dwell in the sea to the ever fascinating and beautiful predators of the land and sky, we will slowly but surely collect snapshots of the beauty and diversity of this remote and utterly unique place in a format never attempted before. And for good reason. IMAX technology is not only new to me; it is new to the world. In fact the two cameras that we are using: the latest Arri Alexa 65 and RED’s Helium, are at least by numbers more rare than the Spirit Bears we are documenting. If someone had told me a year ago I would be assisting on a shoot like this—with technology like this, on a coastline like this, well…. My role as a camera assistant and DIT is mainly to prep equipment and manage the project media, ensuring the vast amounts of digital data that the crew is producing each day are securely backed up and protected. On an IMAX where 8K resolution is the standard, each day of shooting takes up a significant chunk of hard drive space. I spend a lot of time putting together and taking apart a vast array of underwater and topside gear that keeps this shoot moving forward. It means early mornings and late nights, but when your job is making beautiful images nothing seems as bad—especially with the right crew. The team is, of course, a crucial component of any film and fortunately Ian has brought together a capable and hard working one. The diversity of skill sets and each person’s uncanny ability to wear multiple hats when necessary is key. Andy Maser, our second camera operator, is our rock, and gets it done rain and shine, day after day. 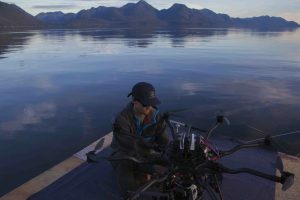 Devin Card, our drone pilot —well, when you’re flying a machine that costs over $150,000.00 from a rolling vessel without a hitch—it pretty much says it all. Nicola, our deckhand and cook, lights up the room with her smile and fills the boat with good vibes and great smells. And of course our intrepid leader Ian continues to take us on a roller coaster ride of amazing locations learned by a lifetime of exploration on this coast. A year is both a long and a short amount of time for a film of this magnitude. We have 250 shooting days and we have already used a fifth of those days. The last remnants of the fall salmon run has been replaced with a fresh coat of snow, and soon the winter outflows will turn the waters we sail through into a cold, clear, winter haven for filming some of the world’s most diverse life. From what I have witnessed and what we have filmed, it is exciting to imagine how this film will evolve with the coming seasons. And like previous mornings, tomorrow I will wake up in the dark and let the slow light of day reveal the next chapter of this stunning place.